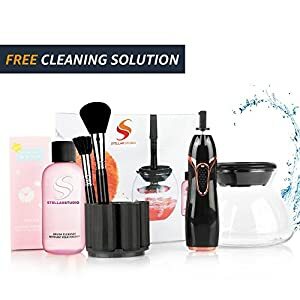 # 1 Best Makeup Brush Cleaning Mat – extend the use of your brushes! 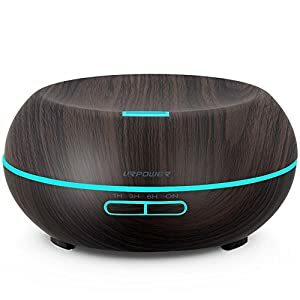 Wood Grain, Unique and Compact Design: This aroma diffuser is coated with wood grain, which makes it look very natural and primitive. 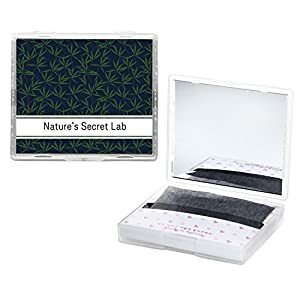 With compact and portable design, the cap of the aroma diffuser is easy to take off, you won’t bother to unscrew the cap with great force when your hands is wet. Just gently take off the cap, add water and essential oil, enjoy high-quality life. 7 Color LED Lights. 7 colors rotating through / Fixed one color steady on / Lights off. Each color is adjustable between bright and dim. A perfect nightlight for a kid’s bedroom and soft light creates romantic atmosphere which helps you escape the hustle and bustle of modern life. MIRROR INCLUDED: Perfect! Compact! Built in mirror! 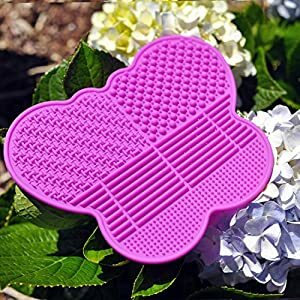 GIVE YOUR MAKEUP BRUSHES NEW LIFE – With its unique butterfly shape, this makeup brush cleaning mat can extend the use of your eye and face brushes. It’s so durable it can also be used as a cleaning mat for artists’ paint brushes. 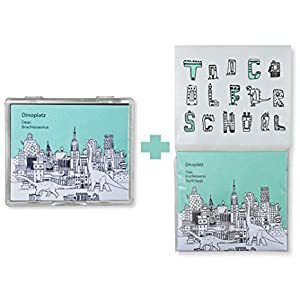 MULTI-TEXTURES – Clean all your brushes at no time to perfection by using four textures of this silicon rubber brush cleaning mat. PERFECT SIZE – Coming in at 7 x 5.5 inches it’s not too large or small. You’ll have plenty of space during use or when storing it. Plus, it’s big enough to clean all types of brushes, including large powder brushes. 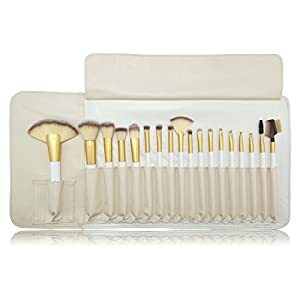 ELEGANT 5 PIECE PROFESSIONAL MAKEUP BRUSH SET – All brushes are 100% cruelty-free, made with the highest quality of synthetic hair which is much more hygienic and more durable than natural hair brushes. 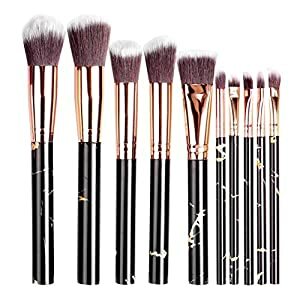 THESE ARE THE TOP 5 MAKEUP BRUSHES EVERY GIRL NEEDS! We got you covered! We made sure our 5-piece set includes every make up brush you’ll need on a day-to-day basis. Here’s what you get: Foundation Brush + Powder/Blush Brush + Angled Liner Brush + Eyeshadow Brush and Lip Brush along with designer case. 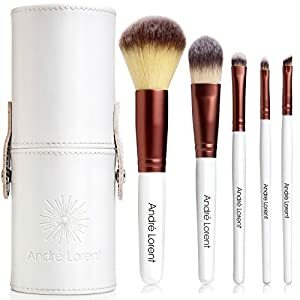 SLEEK WHITE CARRYING CASE – The brushes come in a durable, sleek white carrying case to travel with ease, and it also looks beautiful on your countertop. 【Sturdy and Light】the Marble pattern handles are made with a comfortable and ergonomic design for seemingly effortless movements. 【Cruelty-Free Synthetic Fiber Bristles】soft and comfortable feeling.best for sensitive and normal skin. 【Save time and money】Brush easy to catch powder,liquid,cream,and can recycled use after cleaning,10pcs in a retail packing. 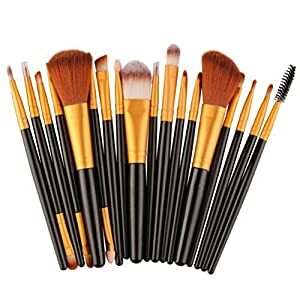 Multifunction: 10pcs makeup brushes kits will meet your different makeup applications, such as eye shadow, foundation, concealer, blush, etc. Can be ideally apply to liquid, powder or cream cosmetics to create your personalized makeup looks as well as show your natural beauty. 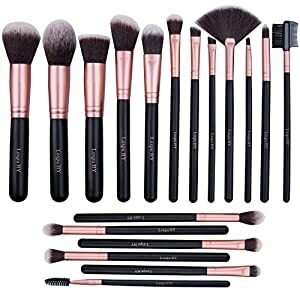 Ultra Soft: This mermaid makeup brushes are made of high density soft nylon bristles, will give you a silky touch feeling. Non-shedding & odour free, which is easy to stick powder to create a flawless makeup looks, and also safe for your delicate skin. 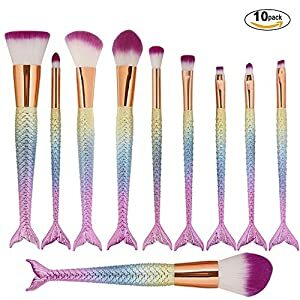 Unique Design: The handles of these makeup brushes are both aluminum tube premium plastic handles in mermaid tail shape with 3D fish scale, will give you an incredible touch feeling. 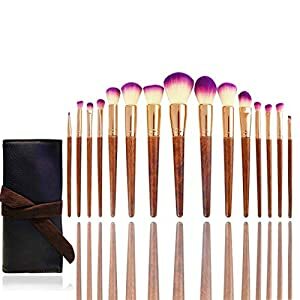 The 10pcs Makeup Brushes are very lightweight, prefect for Home Use and Traveling. Economical brushes set but made by high quality materials. Silky soft. Makes applying makeup a luxurious experience. No shedding, no smell, handle fixed firmly, well made. Premium Synthetic Hair-Softer ,Denser and Silkier than stiff animal hair. No Shedding Hair and Not hurt your smooth skin. 100% non-porous bristles-Perfectly apply powder, cream and liquid products. Hand made with solid wood handle and mental ferrule. 10,000 BRISTLES FOR A PERFECT COVERAGE – Includes over 10,000 silky soft and fine density bristles (in our kabuki, powder, blending and blush brushes) to pick up and distribute makeup products better, from liquid and creams to powder and minerals. QUALITY RE-DEFINED – Learning from flaws of other inferior products, we’ve carefully constructed a truly superior quality brush set that is certain to not have those usual flaws, like leaving hairs behind, or falling apart. 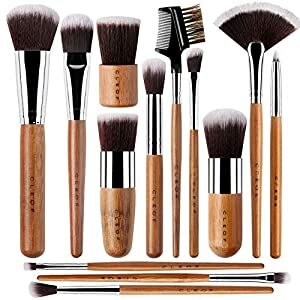 VEGAN AND ECO-FRIENDLY – Because our earth and all its creatures deserve to be protected, and treated with love, these brushes are made with bamboo (the Fastest Growing Plant on Earth) as well as synthetic bristles and not hair from animals. By the professional make-up artist carefully selected production, quality assurance. 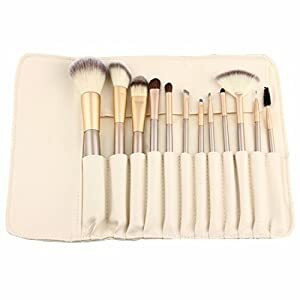 This makeup brush is equipped with a leather case for easy carrying. Unique wooden handle design, to ensure a comfortable feel and easy to use. Suitable for both professional use and home use,Easy to use and convenient to carry. Compatible with any type of foundation,BB Cream,powder,blush,etc. Advanced Synthetic Materials The ultra-soft bristles are made from premium synthetic fibers, allowing for more precise, smooth and streak-free application. Comfortable to Handle High quality and high density, the brushes are easy to handle and use. 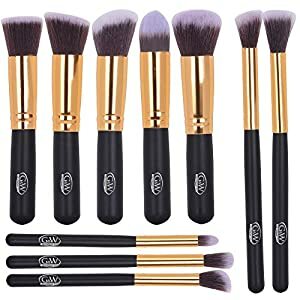 High-End Brush Set The improved manufacturing processes help to prevent bristles from shedding.